Profiled in Washington Gardener Magazine! 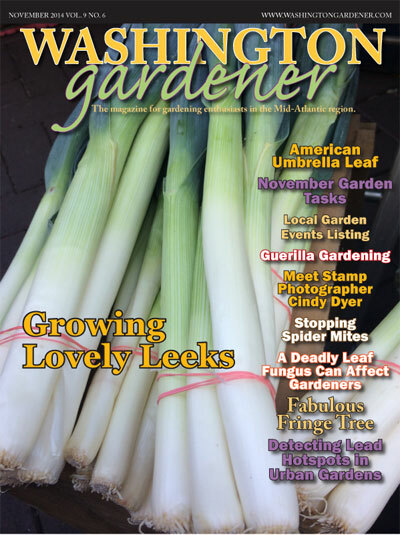 Many thanks to publisher Kathy Jentz for her profile on me in the November issue of her Washington Gardener Magazine. Double click on the link below, then click on the arrow and the pdf will launch. Kathy’s profile on me starts on page 18. 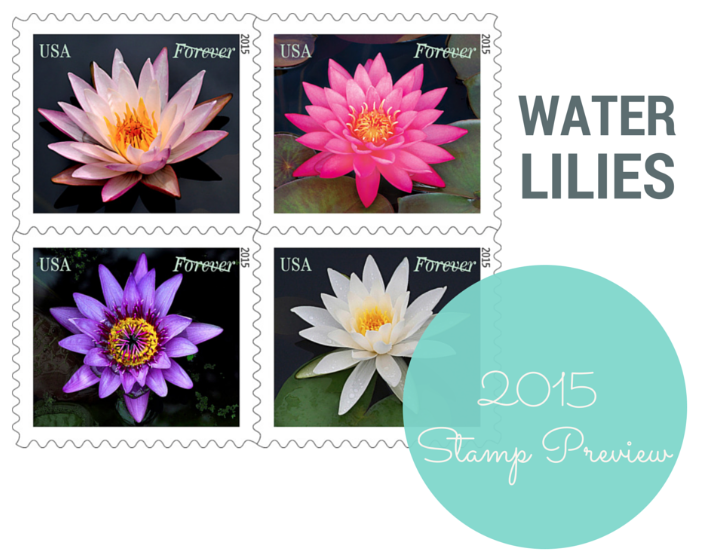 Drumroll, please—more USPS stamps coming! 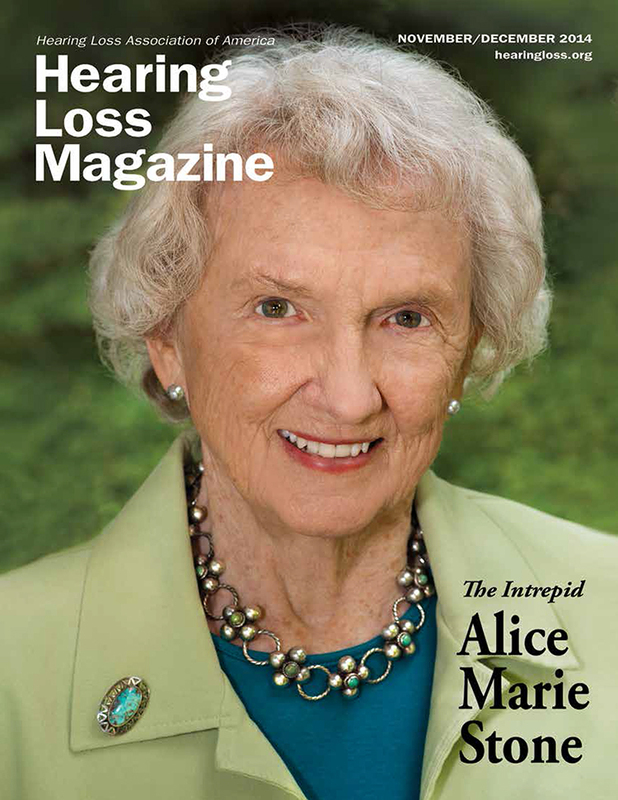 In the November/December 2014 issue of Hearing Loss Magazine (published bimonthly by the Hearing Loss Association of America—HLAA), Barbara Kelley profiles Alice Marie (Ahme) Stone, wife of Rocky Stone, who founded HLAA (then known as SHHH, Self Help for the Hard of Hearing) 35 years ago. I photographed Ahme at her home in Bethesda a few months ago. I learned lots of things I didn’t know about her, Rocky, his career with the CIA and family life on the road. It’s a really fascinating read! After 35 years, in her first interview, Alice Marie (“Ahme”) Stone, wife of Founder Rocky Stone, talks about the early days of the organization as well as some never-written-about-before stories about life with Rocky. Today, Rocky is folklore in both the Central Intelligence Agency (CIA) where he spent his first 25-year career, and folklore in the organization we now call HLAA. What you are about to read has been declassified, but such is the stuff spy thrillers are made of. Ahme is part of the folklore of which we speak. In the book America’s Great Game: The CIA’s Secret Arabists and the Shaping of the Modern Middle East (2013 Basic Books) by Hugh Wilford, the author discusses a case that involved Rocky and Ahme Stone in Syria. Wilford describes Ahme as the “intrepid Alice Marie Stone.” We’ve always known Rocky was fearless, undaunting, unflinching, adventurous, heroic, dynamic, spirited, indomitable, but Ahme too? She’s a Texan having been born in San Antonio on September 11, 1927, and grew up along the Gulf Coast in Corpus Christi. When asked if we could interview her for this article, Ahme said that she is neither talkative nor introspective. Ahme is self-effacing and her ways are genteel but anyone who knows her appreciates her sincerity, depth, faith, sense of humor, and sees her love for people, the organization, Rocky, and her family. In 1978, a year before Rocky founded Self Help for Hard of Hearing People, now known as the Hearing Loss Association of America, Ahme had just earned her master’s degree in pastoral ministry from Trinity University in Washington, D.C. She was completing an internship at Walter Reed Army Hospital and was about to embark on her career at the National Institutes of Health (NIH) in Bethesda, Maryland, as a Catholic chaplain. With her quiet strength, calmness and faith, she ministered to those who were terminally ill and earned respect for her work. Rocky had recently retired from the CIA in 1975 after earning the Agency’s highest award, the Distinguished Intelligence Medal. Along with a bulky body-worn hearing aid attached to his shirt, he was an expert speechreader. Foreign diplomats didn’t believe he was deaf, the term used in those days. One Soviet thought his hearing aid was a recording device. He told Ahme that he wanted to start an organization for people who didn’t hear well. He said they, like he, were “between two worlds”—neither deaf nor hearing. He characterized hearing loss as “an invisible condition” and concluded that no organization existed that focused specifically on people who were not deaf or fully hearing; but, rather, hard of hearing. All the services, organized groups and any available literature focused on people who were deaf and mostly used sign language. There was nothing for people who were hard of hearing and wanted to use technology to function in a hearing world; so he decided to start a new organization called Self Help for Hard of Hearing People (SHHH). In November 1979, Howard E. “Rocky” Stone founded SHHH. Ahme saw the organization move from their home to a small office in Bethesda where Rocky served as the first executive director, unpaid with a staff of four who were also unpaid. (Rocky never took a paycheck as the executive director.) Ahme was deeply impressed with the dedication of this small staff. She remembers Patricia Clickener, the first Board president who took a leave of absence from her executive position at the Chicago ad agency, Leo Burnett, and came to volunteer full time for 20 months. There were countless others over the years. She found it almost unbelievable that people would travel at their own expense from as far as California and Washington to serve on a volunteer Board of Trustees. This was the beginning of Ahme’s hospitality and the opening up of their home with years of Board dinners on the nights before meetings began. Ahme attended all the Board meetings for many years. Most of all, Ahme gave Rocky emotional support. She had been married to Rocky for nearly 30 years at that time and knew he felt passionately about helping other people. This was the time when self-help movements were in full bloom. Rocky used that template to provide people with reliable information to enable them to help themselves; then, in turn, to help others with hearing loss. Those who knew Rocky also knew he had a great intellect and keen insight into human psychology, that’s what made him successful in the CIA. He knew others weren’t so fortunate with the same job opportunities and he wanted to let them know that there were others with hearing loss, that it was not something to be ashamed of, and that they could live successfully with hearing loss. In 1947, Ahme met Rocky at the University of Southern California (USC) where she earned her bachelor’s degree in fine art. Rocky was a teaching assistant in one of her classes. Ahme took her dog to class and Rocky couldn’t help but notice. They made a few quips back and forth. Ahme remembers getting a poor grade in the class and not feeling she deserved it, she took her protest to the professor. It turned out the professor didn’t give her the grade, it was Rocky who did. Let’s say Rocky had met his match. Did he know it? We are not sure. Did Ahme know it? “No,” she says. Ahme’s father, Joe Mueller, advised her that she didn’t have to spend her life behind a typewriter, but it would get her foot in the door. Ahme had other ideas. She wanted to go to Germany or Japan during the Allied Forces occupation in the aftermath of World War II. Her friend told her the CIA was hiring and Ahme replied to her friend saying, “What’s the CIA?” It didn’t matter what it was, it was a chance to go to Washington, D.C. for an interview and a chance at living her dream. Meanwhile, Rocky graduated from the University of Southern California and went to the Johns Hopkins School of Advanced International Studies in Baltimore on a scholarship. Then again, they met at the CIA located at that time in D.C., next to the Lincoln Memorial Reflecting Pool. It was 1950 and Ahme worked the Czechoslovakia desk on the intelligence-gathering side while Rocky was on the operational side of the CIA. Here was another fateful meeting that eventually resulted in their 53-year marriage, or should we say their 53-year adventure? When Rocky was trying to get the word out about the new organization, SHHH, it was often his ventures as a CIA operative that would catch the attention of the media. Renowned journalist David Ignatius wrote a story on the front page of The Wall Street Journal about Rocky’s career in 1979. Rocky agreed to the interview if Ignatius would mention SHHH. At the end of the article, the author included a small paragraph on the inception of SHHH. Hundreds of people from all over the world wrote for information for help with their hearing loss. Ahme was very much part of the CIA days that caught the attention of many. That’s why we can’t talk to Ahme without going back to the days before SHHH. The “intrepid Alice Marie Stone?” Let’s see about that. Rocky recalled later buttoning the uniform of General Fazlollah Zahedi, the CIA’s man in the Iranian military and the Shah’s newly designated prime minister. The general was too nervous to dress himself. Ahme, his young wife, was sitting calmly in a rocking chair in their home. She had a pistol hidden under her knitting as she guarded Ardeshir Zahedi, the general’s 25-year-old son and a friend of the CIA. The younger Zahedi, in later years, would serve as the Shah’s ambassador to the United States. While the Middle East was an active spot, Rocky was posted to the Sudan (North Africa) where on a trip to Kenya, the Stones experienced Mau Mau uprising by native Africans against English colonial rule (c. 1953). Ahme said the Kikuyu [groups of Mau Mau] were slaughtering the colonials and it was a very dangerous time to be there. Rocky’s next posting was to Syria in 1957. Rocky went to Syria while Ahme, pregnant with their fourth child, stayed with the children temporarily in Beirut, Lebanon, until their living quarters were ready. Here she lived above the notorious, high-ranking member of the British intelligence, double agent, Harold “Kim” Philby. He was working with the Soviet Union at the time and was on the last leg of his escape from the British authorities as he was on the run to defect to the Soviet Union. They went to a hotel on their way out of the country and were told not to be too conspicuous. She recalled letting the children bring their pet bunny with them for comfort. The bunny escaped in the hotel lobby and caused a ruckus. So much for a low profile. After the Sudan in Africa the Stones went to the east with posts in Karachi, Pakistan and Kathmandu, Nepal. In Karachi, they were reacquainted with Prime Minister Bhutto, who was a classmate of Rocky’s at USC, and his family. The Stone children went to school with the Bhutto children. Jolie Stone Frank was a classmate of Benazir “Pinkie” Bhutto who became the prime minister of Pakistan and the first woman in history to lead a Muslim nation; she was assassinated in 2007. In Nepal they met Sir Edmund Hillary—the first to climb Mount Everest—and his American team which included Barry Bishop, Tom Hornbein, Willi Unsoeld and others. In June 1966, the Stone family returned to Washington, D.C., with Rocky being medically evacuated with a rare strain of malaria. The next hot spot was a year in Vietnam where Rocky and future CIA Director William Colby were stationed. Ahme and the family couldn’t accompany him. Rocky briefed then-Secretary of Defense Robert McNamara that the war could not be won. He then developed contacts high in the North Vietnamese military and those relationships of mutual respect led to the Paris peace talks. After that, Rocky was stationed in Washington, D.C., as the head of the Soviet Block Division leading the Agency’s intelligence gathering activity against the Soviets around the world. In 1971, they went to Rome, Italy, which was important because a new global war was underway and Rome was the epicenter. International terrorists, the Red Brigade, Baader-Meinhof, Black September and other terrorist organizations were springing to life and it was important to identify and contain them. There were many attacks—at Rome’s Fiumicino Airport, at Tel Aviv’s Lod airport, and at the Munich Olympic Village. During this time, Ahme sadly recalls the tragic assassination of their friends and colleagues in Khartoum, Sudan—Cleo A. Noel, Jr., U.S. ambassador to Sudan, and George “Curt” Moore, foreign service officer, who were both murdered by the Black September Palestinian terrorist group. Both were classmates of Rocky’s at USC. While in Rome, Rocky’s last overseas assignment, and one of Ahme’s favorites, she recalls that the wives didn’t have their usual obligations because the station chiefs wanted everyone to enjoy Rome. So she went to see Fr. Bernhard Häring, a Catholic theologian and friend of the family, seeking advice on what she could be doing. He asked her what she would like to do and Ahme blurted out, “I want to become a chaplain.” Fr. Häring assured her that she could do it, gave her advice, and she began her studies at the Pontifical Gregorian University and the Regina Mundi Pontifical Institute in Rome. Ahme accompanied Rocky on all his overseas tours except for the one to Vietnam. It has been noted that each and every spot where they lived was strategically important from an intelligence perspective for the United States. Few mothers would be prepared to face this harrowing possibility. Was it her training? Her faith? Her youthful naiveté? Her intrepid-ness? After Rocky retired from the CIA, he got immersed in the topic of hearing loss. “He went to Congress, worked with the National Council on Aging and anyone he could to get to understand the issues,” said Ahme. Because of Rocky and members of the early organization, the term “hard of hearing” was inserted into the lexicon for the first time on a national level. The term hard of hearing at the time was critical to creating awareness about millions of people who needed communication access other than a sign language interpreter. For the first time, academic and consumer literature began to address what it was like to be hard of hearing. Ahme says that Rocky was most proud of serving people with hearing loss when the Americans with Disabilities Act of 1990 (ADA) was passed. He and SHHH members advocated for the landmark legislation. The ADA celebrates its 25th anniversary next year. One outcome of the ADA was that communication access guidelines in public places were created both for people who are deaf and for those who are hard of hearing. The law requires “reasonable accommodation” and that can mean different things depending on the person’s needs and the situation. It provides for technology options in addition to sign language interpreters. Rocky Stone was appointed by President Reagan to the Access Board who wrote the regulations for the ADA. If it weren’t for Rocky Stone and SHHH members at the time who gave critical input, there would be nothing in the law other than sign language and captioning. The law puts people with hearing loss on equal footing with others in the workplace and public places. Ahme now counts herself among the 48 million people in the United States today with hearing loss. Ahme knows that people find their information on the Internet, unlike the early days of the organiza-tion. But she says people can’t rely totally on the Web. Rocky retired as executive director of SHHH in 1993. Ahme retired from her work at the National Institutes of Health in 1997 to travel full-time with Rocky for his various “posts,” this time associated with hearing loss, not the CIA. Rocky served as president and board member of the International Federation of Hard of Hearing People, of which HLAA is a member organization, and this required extensive travel. Ahme enjoyed these travels with him. In the years after his retirement, Rocky lost his sight to macular degeneration and had received a cochlear implant because he could no longer use his vision to speechread. Rocky passed away on August 13, 2004, at age 79. Since then, Ahme volunteered at the Father McKenna Center in Washington, D.C., serving breakfast and lunch to homeless men. She keeps up with HLAA members and travels with her children and grandchildren. Her favorite annual trek is to the HLAA Convention where she sees old friends and meets new ones. What stands out about the convention? “Everyone has a smile on the whole time they are there,” she says. During the annual convention Ahme presents the HLAA Alice Marie Stone Family Involvement Award during the Awards Breakfast and Ceremony to a family member of a person with hearing loss who supports their loved one in extraordinary ways. A recipient herself, the award is named and modeled after her support of Rocky and her dedication to the organization and to people with hearing loss. Ahme also presents the Howard E. “Rocky” Stone Humanitarian Award to a former Board member who exemplifies the philosophy and vision of Founder Rocky Stone. Yes, Rocky and Ahme have a background of intrigue, danger and drama. But somehow this led to their life’s work of bringing people with hearing loss together to find solutions. We have a lot to thank Rocky and Ahme for. Not only were they partners in the national security of our country, they were partners in the formation and growth of the organization we now call HLAA. They have always said our organization is about people. The mission is still the same. All the information, education, support, advocacy, and the use of technology, can help the person with hearing loss to get along better, stay connected, work, and be part of a mainstreamed community. Ahme is quick to add that many have worked to make HLAA the organization it is today. She says in addition to Rocky and the family, there was Joan Kleinrock who built the chapter network in the early years along with leaders and members. “There are so many dedicated people, both at the national office, on the Board, and in the chapters, who believe in the mission and deserve credit,” she says. Talking with Ahme, now 87, is a peaceful experience…and fun! She energizes you with her wit and joy of life. She prefers to be outdoors and likes to visit with you among the birds in her garden. Somehow you feel uplifted after having talked with her. As Rocky said, she is the optimal positive person. Ahme never takes credit; she tosses it to others and brings out the best in everyone she meets. Intrepid? Ahme will say not. But, you can decide. She remains a woman of few, yet weighty and gracious words. We’ll finish with some questions and her to-the-point and heartfelt responses. What’s the most fun you’ve had in the 35 years of the organization? Going to the Conventions. What message do you have for our members? The self-help philosophy is still here. Work hard, help yourselves, get out, go to a chapter meeting. Then, go to an HLAA Convention! What is the most important thing you and Rocky shared as a couple during the SHHH/HLAA years? Meeting wonderful people. What has SHHH, now HLAA, meant to your family—your children and grandchildren? The organization is our family. Ahme, if Rocky were alive today, what would he think about our organization’s 35-year history to date? Rocky used to say that the organization can help, but ultimately it comes down to the individual with hearing loss to embrace the message. I think if he were here today, he would be delighted. Barbara Kelley is deputy executive director and editor-in-chief of Hearing Loss Magazine. She thanks Ahme for sharing her time for this article and to her four children for helping to recall many of the stories—Jolie Stone Frank, Ted Stone, Michael Stone, and Melanie Stone Hogan. Barbara Kelley can be reached at bkelley@hearingloss.org.